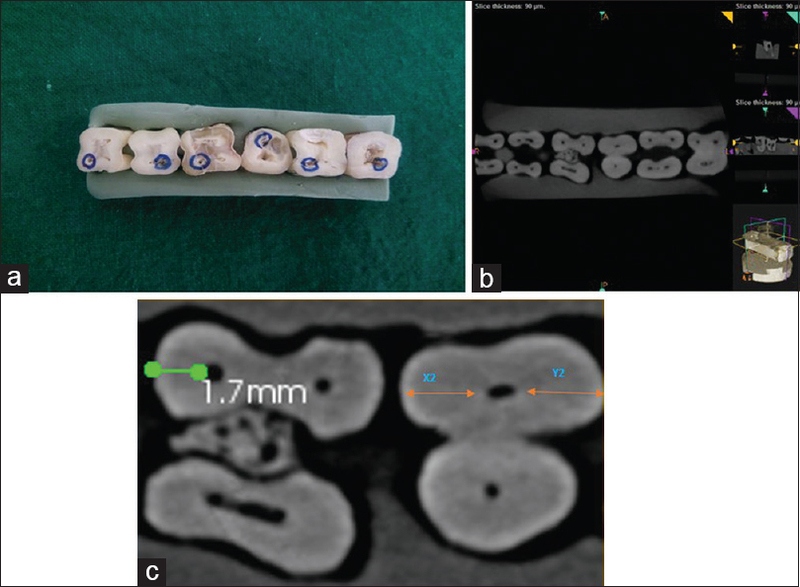 The crown of each selected tooth was removed at the level of the cementum enamel junction using a diamond disc to obtain a root canal measuring 12 mm in length of mesiobuccal canal and the specimens were embedded in acrilic resin employing an endodontic cube [Figure 1]a. Group 3 - The canals were prepared using V Taper SS White file system with the sequence 25 (V08), 30 (V10) for coronal shaping and for apical shaping sequence 30 (V10), 25 (V08) files was used at the rotational speed of 250 rpm with a torque value of 455 g/cm. 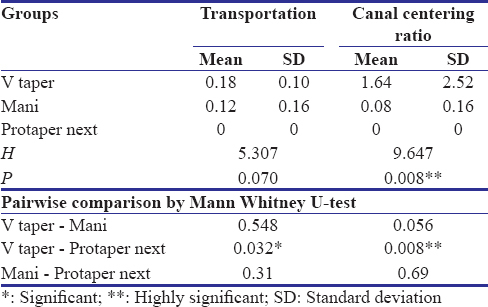 Mean and standard deviation values of canal centering ratio and canal transportation in apical region for three groups [Table 1] and [Table 2]. Gergi R, Rjeily JA, Sader J, Naaman A. Comparison of canal transportation and centering ability of twisted files, Pathfile-ProTaper system, and stainless steel hand K-files by using computed tomography. J Endod 2010;36:904-7. Serene TP, Adams JD, Saxena A. Nickel-Titanium Instruments: Applications in Endodontics. St. Louis: Ishiaku EuroAmerica; 1995. Uroz-Torres D, González-Rodríguez MP, Ferrer-Luque CM. Shaping ability of mtwo and twisted file rotary systems in curved root canals. J Clin Exp Dent 2012;4:275-80. American Association of Endodontists. Glossary of endodontic terms. In: Transportation. Chicago: American Association of Endodontists; 2003. Gluskin AH, Brown DC, Buchanan LS. A reconstructed computerized tomographic comparison of Ni-Ti rotary GT files versus traditional instruments in canals shaped by novice operators. Int Endod J 2001;34:476-84. Stern S, Patel S, Foschi F, Sherriff M, Mannocci F. Changes in centring and shaping ability using three nickel-Titanium instrumentation techniques analysed by micro-computed tomography (μCT). Int Endod J 2012;45:514-23. Ruddle CJ, Machtou P, West JD. The shaping movement: Fifth-generation technology. Dent Today 2013;32:94, 96-9. Dhingra A, Banerjee S, Aggarwal N, Yadav V. Canal shaping with ProTaper next: An ex vivo study. Int J Sci Study 2014;2:1-4. 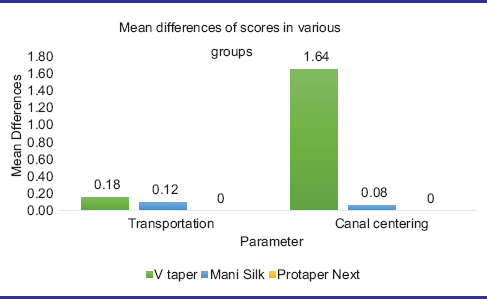 Chandrasekhar P, Shetty RU, Adlakha T, Shende S, Podar R. A comparison of two NiTi rotary systems, protaper next and silk for root canal cleaning ability (An in vitro study). Indian J Conserv Endod 2016;1:22-4. Mounce, R. Mani Silk: A new and novel means of predictable canal shaping. Endod Prac 2015. Kum KY, Spängberg L, Cha BY, Il-Young J, Msd, Seung-Jong L, et al. Shaping ability of three ProFile rotary instrumentation techniques in simulated resin root canals. J Endod 2000;26:719-23. Backman CA, Oswald RJ, Pitts DL. A radiographic comparison of two root canal instrumentation techniques. J Endod 1992;18:19-24. Vyver P. Creating a glide path for rotary NiTi instruments: Part one. Int Dent J 2010;13:6-10. Shenoi PR, Luniya DA, Badole GP, Makade CS, Kubde R, Khode RT. Comparative evaluation of shaping ability of V-taper 2H, ProTaper next, and HyFlex CM in curved canals using cone-beam computed tomography: An in vitro study. Indian J Dent Res 2017;28:181-6. Vander Vyver PJ, Scianamblo MJ. Clinical guidelines for the use of Protaper Next instruments- part 1. Dent Trib Asia Pac Ed 2014;10:12-6. Wu H, Peng C, Bai Y, Hu X, Wang L, Li C, et al. Shaping ability of ProTaper universal, WaveOne and ProTaper next in simulated L-shaped and S-shaped root canals. BMC Oral Health 2015;15:27. Kunert GG, Camargo Fontanella VR, de Moura AA, Barletta FB. Analysis of apical root transportation associated with ProTaper universal F3 and F4 instruments by using digital subtraction radiography. J Endod 2010;36:1052-5.